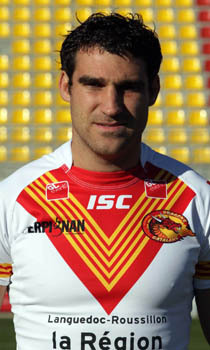 Bosc, found at either stand-off or scrum-half, came through the ranks of the French Elite Championship side, UTC, the senior squad of which went on to form the Catalan Dragons, and having been part of the Dragons squad which were involved in the clubs first ever season in Super League, he is certainly Catalan through and through. With a kicking success rate of over 80%, it is no surprise that he is the Dragon’s all time top points scorer. Known for his mental strength, remarkable vision, high work rate and nifty footwork, he is indispensible to the Perpignan outfit. Thomas has represented France in the 2008 Rugby League World Cup and the 2009 Four Nations, the versatile Frenchman will no doubt be in Trent Robinson’s plans.